Less than eight months ago, SA’s Player-of-the-Year ran the risk of remaining a jack-of-all-trades. Thankfully that’s changed. 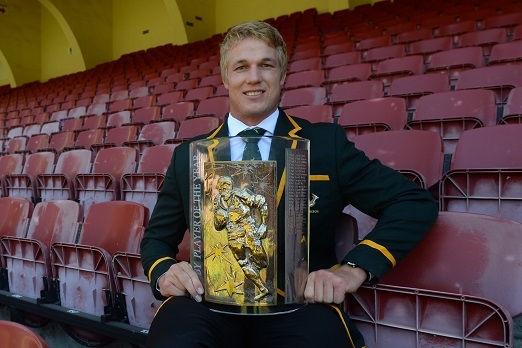 After being crowned SA Rugby Player-of-the-Year for a second time on Thursday, Pieter-Steph du Toit was asked a predictable question: where’s the Stormers going to play him in 2019? It’s a weird realisation, that just seven months ago the 26-year-old was still very much considered a lock. Now he’s considered one of the best blindside flankers in world rugby. And that’s given him leverage with his franchise coach, Robbie Fleck. “I told him I’m a No 7 flank. I enjoy my rugby more there,” said Du Toit. Unsurprisingly, Fleck selected him there for this weekend’s final warm-up against Boland. It’s likely that he’s also done enough to convince national coach Rassie Erasmus of his worth in the position though there’s no clarity yet. “He didn’t specifically say that’s where he’d like to see me play, but it’s more or less what I assumed. I was told that I’ll have to play flank and lock. I have to be the versatile player,” said Du Toit. Regardless, opponents won’t be focusing too much on that – they simply need to find a way of stopping him. Because he’s a man on a mission. “There’s a lot I can improve on. I want to become a stronger ball-carrier and make more linebreaks. I can also do more to secure the ball at the rucks and ensure that the opposition battles to make the steal,” said Du Toit.